Note from The Future: I did end up, all these years later, posting a couple dozen more Sailor Hellsing pages. Enjoy. Q. So now that Shine is wrapping up, is there any plan to restart Bishoujo Kishi Sailor Hellsing? Integra: The doujinshi-ka gets this question on a semi-regular basis. The short answer is: No. Look, let me break this down for you. 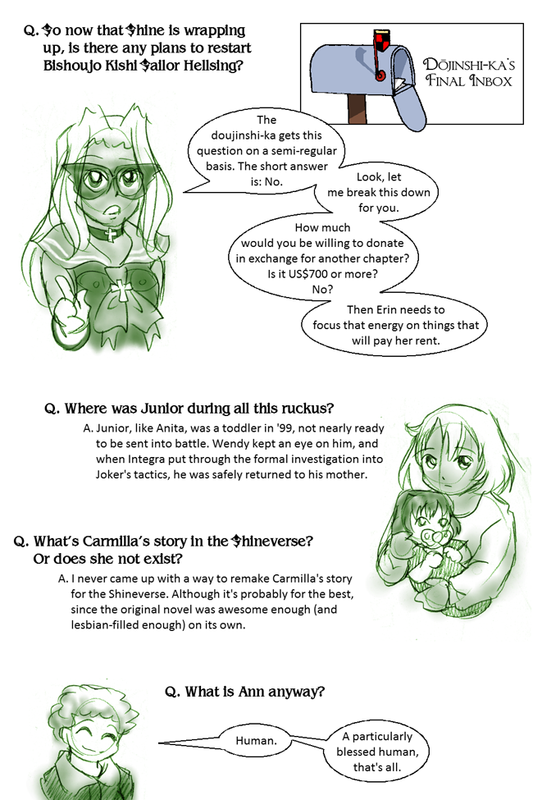 How much would you be willing to donate in exchange for another chapter? Is it US$700 or more? No? Then Erin needs to focus that energy on things that will pay her rent. Q. Where was Junior during all this ruckus? A. Junior, like Anita, was a toddler in ’99, not nearly ready to be sent into battle. Wendy kept an eye on him, and when Integra put through the formal investigation into Joker’s tactics, he was safely returned to his mother. Q. What’s Carmilla’s story in the Shineverse? Or does she not exist? A. I never came up with a way to remake Carmilla’s story for the Shineverse. Although it’s probably for the best, since the original novel was awesome enough (and lesbian-filled enough) on its own. Q. What is Ann anyway? A. Human. A particularly blessed human, that’s all.